Sometimes I get stuck with a can of paint I don't really know what to do with. I find every color in Annie Sloan's paint line beautiful in their own right, but certain colors simply aren't marketable to my clients. I paint because I love the process and I take pride creating something from pieces of the past. And as stunning as it could be, not many people are in need of a bright lavender-pink dresser! The color in question is Annie Sloan's Henrietta, and I was on a mission to use this color somehow, since I hate wasting anything! I'd recently purchased a mix mat from my local Annie Sloan stockist, Chalk it Up, and it's incredible how a simple silicone mat gave me the courage to combine two very unlikely colors: the aforementioned lavender pink, Henrietta and a deep and bright green turquoise, Florence. One of the main tenets of Annie Sloan is that her paints are easy to mix due to the minimal use of black in her pigments. Even when mixing odd combinations, the colors remain bright and pure, and this buffet and hutch is a testament to that. To create this gorgeous turquoise, I mixed nearly equal parts of Henrietta and Florence. I then gave the piece a light wash in pure florence, just to allow the color to look a bit more uneven and watery. Depending on how the light hits it, the colors of the piece change and allow it to look stunning from any angle. I find when I combine paint colors the way I did, this chameleon-like effect becomes all the more prominent and I just can't get enough! 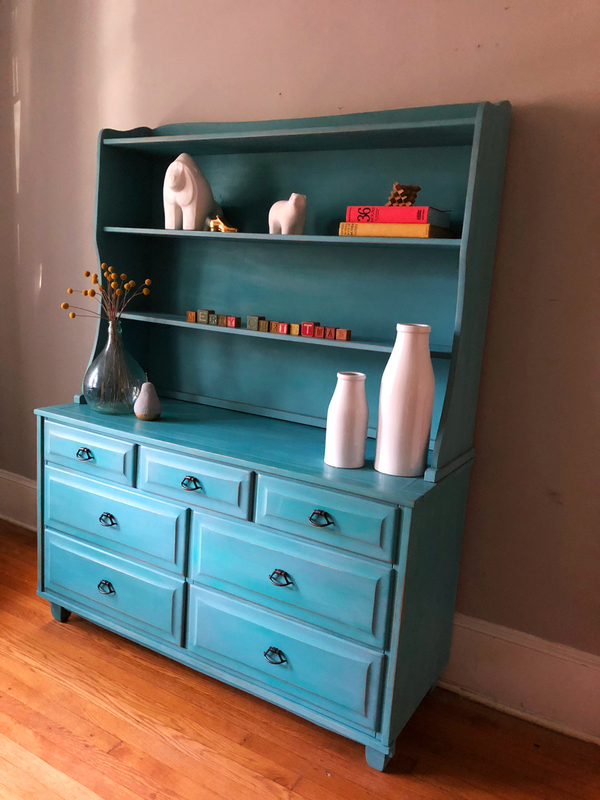 This piece is now up for sale in my shop and I'm already considering parting ways with another piece in my home just so I can make this a permanent fixture, but hopefully someone finds a perfect spot in their space for this gorgeous turquoise piece!